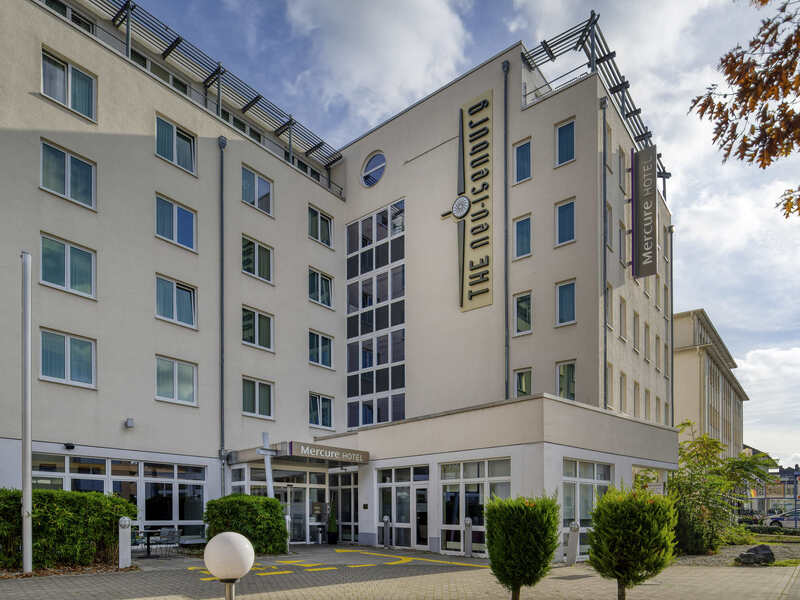 The 4-star Mercure Hotel Frankfurt Airport Neu-Isenburg is located in the center of Neu-Isenburg on the southern outskirts of the Rhein-Main metropolis. All 143 rooms are air-conditioned and have DSL connections and free WIFI. Our meeting area with five rooms accommodating up to 150 people is perfect for your private or business functions. Frankfurt main train station is 5.6 miles (9 km) away, and it is also just 5.6 miles (9 km) to the airport. You can reach us by car via the A3 highway. Neu-Isenburg was founded centuries ago by the Huguenots. Today, the city prospers thanks to its proximity to Frankfurt and the airport - only the City Forest separates Neu-Isenburg from the southern part of Frankfurt, Sachsenhausen. The "Bar Bistro Mainhattan" offers regional and international cuisine. For your business events with up to 150 participants, we recommend the 5 meeting rooms and separate lobby for conference events at the Mercure Neu Isenburg hotel. They meet modern standards in terms of technology and service and are fully air-conditionedand have free WIFI. Natural light gives the rooms a pleasant atmosphere. In nice weather your guests can spend their breaks out on the sun terrace. Would you like help organizing your event?Our qualified staff are always on hand with advice and support from planning through to hosting your event. Please enquire and we will be delighted to discuss the details with you. At the 4-star Mercure Hotel Frankfurt Airport Neu-Isenburg you can choose between Standard Rooms with king-size or double beds and spacious Privilege Rooms with king-size beds, bathrobe, newspaper and other extras. Upon request, wewill be happy to provide you with a three-bed room. All 143 rooms are air-conditioned and have DSL - most rooms also have WIFI. One child aged up to 16 may stay in your room free of charge. Pets are also welcome (charge of EUR 12/night). Our standard double rooms - tailored to your needs. Apart from TV and telephone, they have a high-quality double bed, comfortable seating, a functional work place with free WiFi, hair dryer and A/C. Our twin bed room-ideally tailored to your needs. In addition to TV and telephone, they have a high-quality bed, comfortable chairs, a functional workplace with free WiFi, hair dryer and A/C. Our Privilege rooms for more comfort. VIP bathroom fittings including bathrobe, mineral water, coffee machine, newspaper, air conditioner, free WiFi and late check-out. Privilege Rooms with air conditioning. For added comfort: VIP bathroom including bathrobes, mineral water and coffee and tea facilities in the room plus complimentary newspaper. WIFI and late check-out also included. Our Standard Rooms are ideally suited to your needs. In addition to a TV and telephone, they are equipped with a high-quality bed, comfortable seating, a functional desk space with free WIFI, a hairdryer and air conditioning. Enjoy a light snack, a coffee or a cold beer in the cozy surroundings of our "Mainhattan" bar, which is open from 5pm to 1am. The perfect place to get away from everyday stresses and meet other hotel guests. Mattress was of poor quality, worn down. Room was extremely warm, difficult to get heat out of the room even with window open. AC made it wormer (it was cold outside, maybe that was the reason why it function as a heater instead of an AC?). Further, the hotel corridors where also extremely warm. Think of the environment and your bottom line. It doesn’t need to be 25 degrees in the corridors. The staff is very friendly and they are doing their best. As mentioned above, the rooms seem old an worn out. The rooms smell very strange - they try to cover it with a room scent - which doesn't work and causes headaches. In this condition, I wouldn’t recommend this hotel to any of my peers. I do not know the names of the personal but as always, I received a great welcome from the people working at the bar and at the breakfast restaurant. The hotel is nice, but it also is a little loud. The staff is very friendly and the bar offers a good menue. Sometimes however, you get the feeling that some restauration work might be needed in the room, mainly in the bathroom. Nonetheless, this is sitll a high quality hotel, eventhough the breakfast is pretty expensive. Tasteful breakfast, staff as always very nice and friendly. The biggest minus was the unmanned check in desk and the experience after: the lady did not found my reservation in the system, so we had to start over. But the hotel, the room and the bathroom is excellent, no issues there. I kinda missed a gym, where I could run a bit, but this is also acceptable, no big loss. The services are average. Bed and furniture looks more an Ibis Hotel than a Mercure. No Gym. Crazy expensive and no easy public transport available for Frankfurt. Reasonable for a business trip if you stay in Neu-Isenburg or around. But the price was apportunistic and abusive. My stay is good, I have been here several times, it would be better if the hotel can provide a shuttle service during the morning peak hour, so that people can go to the office easily. The hotel looks old and definately needs renovation. The walls in the room are very dirty, the shower as well. On the good side, WiFi worked well. The breakfast was also fine. I like staying in the Mecure. Staff are friendly, efficient and very welcoming. The only gamble there is on a trip is the room temperature. My room didn't have the ability to chill, only produce warm air. On entry the room was already stuffy/warm. Opening of the window, doesn't provide a comfortable sleep as the road outside is quite a busy one. Staff and cleanness are great, however the hotel seems like a 1 star hotel. No fridge in the room, no drinking water, not even for sale, instead Capri Sonne is offered. That seems like the most unhealthy and non thirst quenching choice. There is no real closet, no safe, and the quality of towels and bedsheets seems very cheap. I overall don't sleep good at the Mercure because of the poor quality of the pillow and mattress. Nice staff and fairly acceptable facilities concerning the price. The staff is friendly and super helpful. As a preferred business hotel, I know that it is know for having heating system problems. But after all these years, can this not be fixed ? The temperature is super hot, plus when you turn on the AC the temperature stays very warm. This makes me decide to change hotel for my next HQ office trip. Or can you please fix it. Now I solved it with opening a window. But what to do in the summer ? I was extremely disappointed that when I arrived at the Hotel that the Restaurant and Bar were closed for the evening. I was told that it was closed because their were not allot of people staying at the hotel that evening. I had also purchased breakfast in advance and due to not so many people in the hotel their was not much on display to choose from. I used the Accor Website to select a hotel with specific services, them being a restaurant and a bar. I also used my points for this hotel which makes it more frustrating. I feel if your Hotel is not going to regularly provide the services listed then you should update your site.